During recent years, there has been a growing awareness that a better understanding of human activities and the behavioural components of environmental problems is needed. This volume brings together psychologists, philosophers, sociologists, historians of technology and economics, and management experts to identify and examine the rules and motives that govern the environmental behaviour of individuals, households, organizations and society as a whole. 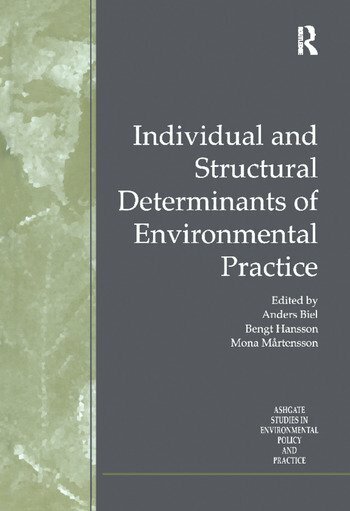 Illustrated with case studies from Scandinavia, it shows how behaviours with negative or positive environmental effects are often performed without such consequences in mind. The book discusses how change towards positive environmental behaviour often conflicts with deep-rooted habits as well as exploring the importance for environmental practice of different everyday contexts. By presenting this multi-disciplinary analysis, the volume provides a comprehensive understanding of how behavioural change in relation to the environment can come about and how this can be integrated in the political framework. Contents: Introduction: Perspectives on environmental practice, Anders Biel. Environmental Practice: Individual, Organizational and Societal: Environmental behaviour: changing habits in a social context, Anders Biel; Everyday life contexts and the environment, Mona MÃ¥rtensson and Ronny Pettersson; The formation of green identities - consumers and providers, Anna-Lisa Lindén and Mikael Klintman; Markets, business and sustainable repositioning, Rolf Wolff and Olof Zaring; Legal and governing strategies - towards a law of sustainable development, HÃ¥kan Hydén and Minna Gillberg; Redirecting infrasystems towards sustainability, Arne Kaijser. Commentary: A dialogue concerning the usefulness of the social sciences, Bengt Hansson; Social-ecological resilience and behavioural responses, Carl Folke; Index. Mona Martensson is Associate Professor at Stockholm University, Sweden.